The van packed as if we moved our entire house into it and leaving only enough space for us. It is filled with our essentials, camping gear, tree tend, stand-up paddleboards, yoga mats, and a week’s worth of our favorite sardinian food. The radio echoes out our favorite travel song. We are heading into the unknown, a place where we surrender to nature and let go of the real world. In our day-to-day lives, we have a tendency to live in a routine, we get our coffee from our favorite corner coffee shop, make our smoothie filled with greens and fruits and head to work. At the office the routine continues, we check the same websites, daydream about the next adventure and send out a few emails. Then as we leave the constraints of the office, our freedom is filled with more of the routine, we head to the same yoga class, have the same dinner and watch our new favorite Netflix series. Day-to-day, week-to-week, the routine continues, maybe with some variation but still falling into the similar mold as the day before. And we may be perfectly happy and content living this life, we know the neighborhood barista who makes our coffee, we love our office chats and the yoga instructor we see. But what if we were to throw a weekend of change in the mix and challenge ourselves to explore the world outside of what we know, out of our confort zone? 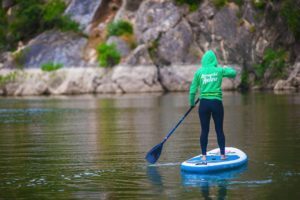 Yoga, stand-up paddleboarding, hiking, and camping can provide the perfect excursion to free our minds and open us up to the possibilities that exist at our fingertips. 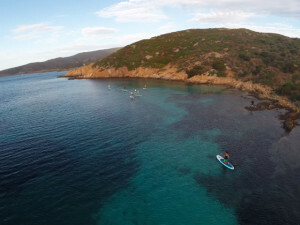 Here in Sardinia, we are fortunate to be surrounded by so many wild places, setting up for the perfect adventure. Campsites, trails and some of the most magical beaches in the world are all waiting to be explored. We may even be able to combine adventures, such as paddling to an island full of miniature albino donkeys, building our campsite while practicing yoga on our own private beach. The opportunities are endless and the adventure awaits! So the next time you are in the office visiting that same website to start the daydream of that perfect vacation, stray from the path and research what local playground is close by!